Mascara is one of my favorite beauty products. Ok, it is my fave. I admit it! If there's a new one, I must will try it. 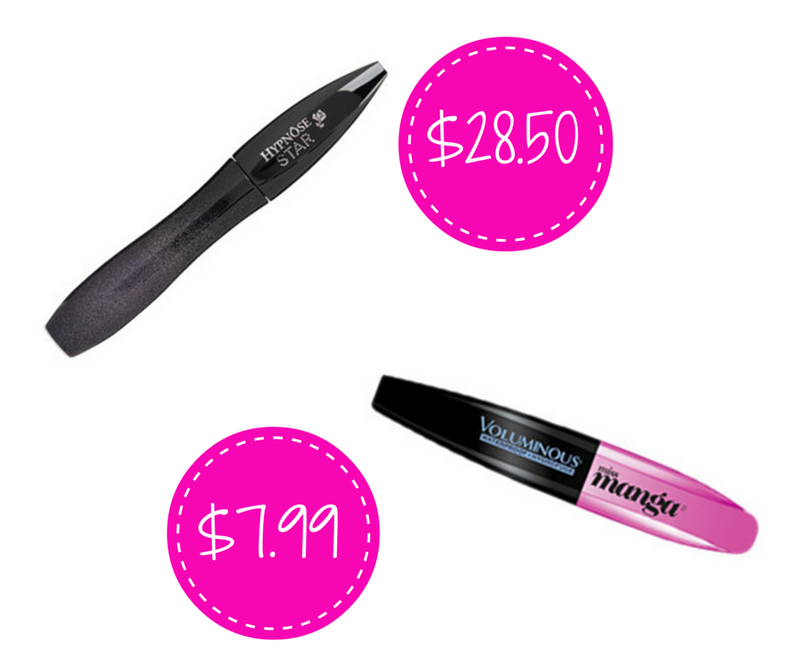 I tend to love drugstore mascaras, like L'Oreal Miss Manga, but occasionally I will splurge. Once such example is Lancome Hypnose Star. Lancome makes some of my fave high-end mascaras (and they have gorgeous packaging too). So I decided to put this against a comparable drugstore option, L'Oreal Miss Manga (there are at least three in the Miss Manga series, pictured is the original). I chose it because the wand is similar (see a better picture here) and because Lancome is a subsidary of L'Oreal. Did you know that? I had to find out which is better, this or that? This is after 8 hours of wear. Price--Lancome Hypnose Star is $28.50 (look for it at Sephora) and L'Oreal Miss Manga is $7.99 (drugstores, ULTA). Scent & Formula--Both have a scent with Hypnose Star being very strong if you give it a good whiff. The formula is wet" as opposed to a drier mascara. L'Oreal was a bit wetter and thicker. Wear--Both had a tiny bit of flaking after an 8 hour day consisting of a 5 yr old and 1 yr old pawing and rubbing at my face. This is also after playing (aka sweating) outside for 1.5 hours in 84 degree temps. Hypnose Star was more prone to clumps on the bottom whereas Miss Manga was clumpier on the top (it is actually marketed for this look). Length and Volume--Both mascaras were tested individually and side by side for several months in spring and summer conditions, worn a minimum of 4 hours for as much as 14. Hypnose Star gives more length but Miss Manga gave more volume. This or That--While I enjoyed them both, I would probably purchase Miss Manga since it is cheaper. But it comes down to the look you want as well, as I prefer the Hypnose Star. I'm looking for something new to watch on tv--any ideas? Both are great but I can definitely tell a difference with the Lancome one! Your eyelashes look amazing! I don't notice a huge difference between the two with this look. I tend to stay away from mascaras that may have clumping because my eyelashes are sparse and thin...clumping can be disastrous for me! I did know that Loreal was an affiliate of Lancome...so I usually tend to lean towards them more than some other drugstore brands. I really love Lancome though and used to be exclusive to them back in the day. I will always have room in my heart for their mascaras! And their eyeshadows too. That is hilarious about the rock bank. Five year olds have the best imaginations! I watch a ton of TV shows, what kind of show are you looking for? Funny? Action? i'm the same as you - mascara is my FAVE. i seriously have like 17 right now, which i know isn't that much for a mascara junkie. i'm not allowed to buy any more for a little while though. i had no idea about l'oreal being under lancome. i have never tried a lancome mascara. currently i'm using the l'oreal voluminous but the original one. i haven't tried the manga one yet. ahhh TV show. I recently watched Cranford & Return to Cranford (like a mini series type deal like P&P almost but also not really) and last night I started the mindy project lol. it's funny so far. I have heard so much about Parenthood that one day I am going to binge watch it! I also want to re-watch Doctor Who before I meet one of the stars in August, and her other TV shows The Secret Diary of a Call Girl (pretty funny) and Penny Dreadful, but that's like horror so I don't know if I can handle it! I love your reviews. I totally want to try Miss Manga. I couldn't find it at my CVS tho. Ugh, gotta try another drugstore. Love it when you do the This or That posts. I have been trying so many mascaras lately, and I don't feel like any of them have been living up to the hype. I will have to check out the miss Manga. I prefer the look of the Miss Manga myself, so I would definitely check that one out! I've been wearing lancome mascara for years but now I'm going to try Miss Manga! Thanks for sharing! Honestly I think both look great, especially after 8 hours of wear! I would lean towards the Miss Manga just because I prefer more volume! Great comparison! Going to have to try the manga once my covergirl one runs out. I only watch Netflix. I just watch both season of the young and hungry last month. They are 30 min episodes. I like that the less expensive option wins! I've been using L'Oreal Voluminous mascara for years and will give Miss Manga a try! Thanks for testing those both out - they really do like almost identical! I am a HUGE L'Oreal mascara fan. I use the Voluminous and am obsessed with it. Its the best I've ever used - even when I compare to Dior. I haven't tried either. I'll def check out both! Great info!! I'm ALWAYS trying new mascara and I'll have to check these out! You seriously have the prettiest eyes!! Love this comparison, I always go for L'oreal since they're a subsidiary of Lancome, and I've always been pretty happy with their mascaras! I love mascara! I have been obsessed with MAC lately because I keep getting free samples from Nordstrom, but will have to check these out when they run dry! There is a mascara that is marketed specifically for upper lash clumping? Did I understand that right? Because I will spend an extra few minutes declumping my mascara. It would take alot for me to purchase a high end mascara now a days. There are so many awesome drug store ones! 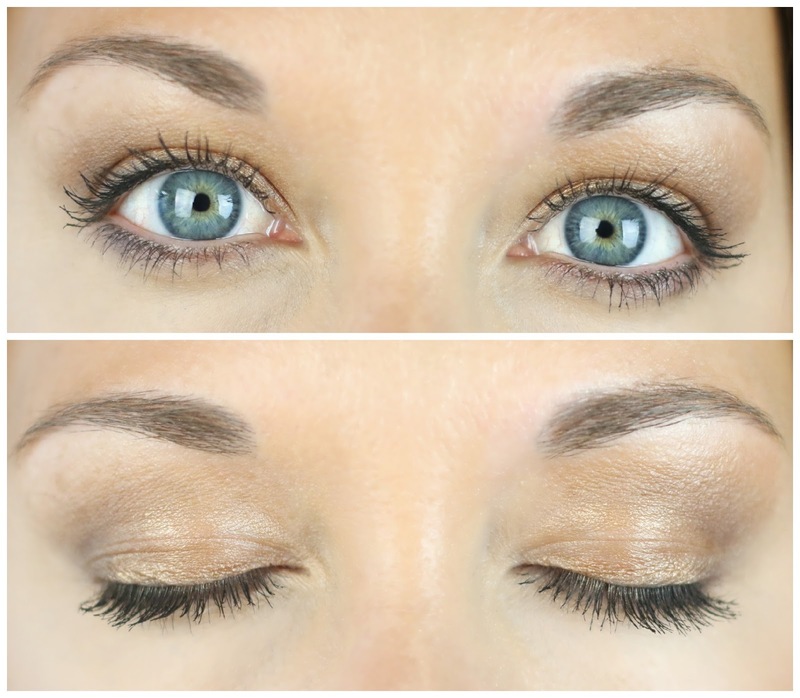 I love trying new mascaras and I always love reading your honest, thorough reviews! I'll have to try the Miss Manga (you know me--I'm too cheap for the Lancome!) next time I buy new. Right now I'm using SuperSizer (L'Oreal maybe?) and I really like it. I like that the Miss Manga gives more volume and you can't beat the price! Definitely a winner! Both of these look like awesome mascaras! I've been wanting to try the Miss Manga one since I love big lashes and I'm running out of my current mascara. I am the same way with mascara! Whenever I see a new one at Ulta or Target, I HAVE to try it. Somehow I managed to walk out of the house without mascara this morning, I must have been in a real fog. I love Miss Manga and the Miss Manga Rock. I like wetter mascaras, the drier one do nothing for my lashes. Check out Friday Night Lights on Netflix! I'm still so obsessed that I'm watching it over again. Hellllo gorgeous eyes!!! Every time I try other mascaras I always go back to Loreal telescopic! I love trying out new mascaras! The Miss Manga one I think actually looks prettier, which is a bonus because of the cost. I need to try it out! So excited you asked - TRUE DETECTIVE. Colin Farrel, SO GOOD. I absolutely love this thorough review. I did know about Lancome and Loreal, but I always find that Loreal tends to be thicker, like you mentioned. I try to stray from my fave They're Real! but I keep coming back. Thanks so much for such a thorough post!!! Stuff to watch? The Tudors. Gilmore Girls. Lost. Gotham. Scrubs. The Office. I love the one on the left! I think it looks better <3 Thanks for the tips, I am always looking to find new mascaras!! Mascara is my favorite too! L'Oreal has always been my go-to for mascara! Thanks for the review! I love mascara! It dramatically changes my makeup. I have such thin and light eyelashes, that I have to wear mascara. I love the side by side comparison. How great that the cheaper price mascara is just as good, if not better, than the expensive one! Mascara is the one thing I haven't found that I LOVE. I've tried so many different kinds and can't find a must have. I'll have to try these! I haven't tried Hypnose Star, but I use Miss Manga all the time. And I've also tried the new one that's rockstar manga or something like that. I like the way Hypnose Star looks on you! I think I tried Hypnose a while ago. I bought miss Manga recently and you are reminding me to break it out! Oh, I didn't know that Lancome was/is a subsidiary6 of L'Oreal! I would like to try Miss Manga, but my trusted mascara is Hypnose by Lancome for years... but the other seems to be great as well! I've never tried Hypnose but have read good reviews on it. I do like Miss Manga after it dried down a little, it's a decent one and pretty good on my lashes. Great review - I would probably also go for the less expensive option. Haha, that's so cute about the girls you look after. 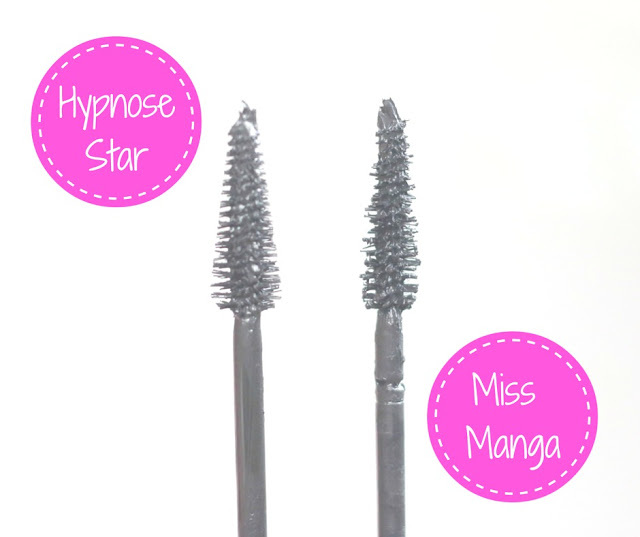 I'm a big fan of Loreal Miss Manga mascara so I was happy to hear you preferred it to the Lancome Hypnose Star. I usually don't like to pay more then $10 for mascara since I ahve to discard it in a few months. I love the Loreal one and just repurchaed it. They both look great on your lsshes! Thanks for the great review! I need to try the Manga! They both look similar enough that I'd opt for the cheaper one. It's not like the Lancome one BLOWS me away. Thanks for the review! Mascara is my favorite too. It's the one cosmetic that I can't leave my house without putting on! I like the L'Oréal better from your pictures and the price! I use the Miss Manga and LOVE IT!! LOVE this side by side comparison!! I bought the Miss Manga a few weeks ago and only gave it one try -- I need to break it out and try again! looks great! Great info...I love when drugstore beauty products wine..I'm a huge fan of Maybelline for mascara! They look pretty similar, I like them both and your eyes are so pretty! Ha ha! I love the Extra Elles! The rock band thing is cracking me up! That is hilarious and so cute! You know I'm a HUGE Miss Manga lover, but oddly enough, I hate Hypnose Star! It was at least 1 year and a half ago when I tried it (way before I got Miss Manga-fied) but your side by side is compelling evidence that maybe I was wrong! They look identical on the lashes! Though that's good b/c it's a nice $ savings to stick with Manga! Thanks, Elle! The Lancome mascara really made a difference…I need to try this stat! Great review as always…thanks for sharing!